If Badi Assad were not a musician, she would merely be one of the most beautiful women in the world. However, she is much more than that. She is a unique talent in the guitar world who combines virtuoso guitar playing with singing, humming, vocal percussion (a la Bobby McFerrin), and hand percussion, often juggling all these things at the same time. Her first two CDs on the Chesky Recordings label, "Solo" and "Rhythms" display a greater musical talent beyond just good guitar playing and singing while accompanying herself on guitar. The music she performs doesn't fit neatly in one or even several categories. Her solo guitar playing repertoire consists of contemporary classical guitar music by composers such as Roland Dyens, Ralph Towner, her brother Sergio Assad, and other 20th Century Brazilian composers. 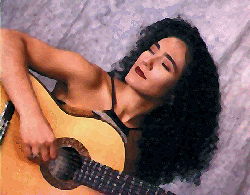 Her vocal/guitar/percussion repertoire is comprised of popular Brazilian songs but are arranged with the complexity of multi-instrumental orchestrations. She is admirable in each individual aspect of her musicianship, but when she combines all of her formidable talents in a single piece of music, she becomes a one-woman wall of sound. The following interview was conducted on October 25, 1996 at the KMFA radio studios in Austin, Texas for future broadcast on the Classical Guitar Alive! radio program. She had performed a sold-out concert the previous day in the Texas Student Union Ballroom on the campus of the University of Texas at Austin. 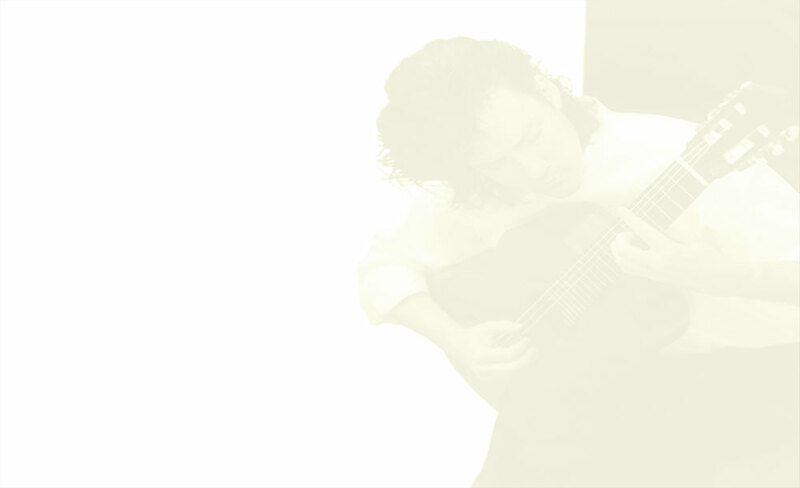 This is Badi's second interview for Classical Guitar Alive! ; the first was conducted almost exactly a year ago in Dallas during her first US concert tour. The previous interview will be transcribed at a later date. On a technical note, transcribing the texts of interviews is a lot like transcribing music for guitar from that which was written for another instrument. You have to decide what is meaningful and remain true to the source, but you also have to edit out things (like "um"s, and making allowances for grammar, etc.) This is especially true and especially difficult when the interviewee is not speaking in their native language. I�ve tried to do as little editing as possible, and have put my editing in parentheses. I only wish I could notate Badi's wonderful Rio accent! Words like "this" sound like "dees". Words like "realized" and "stopped" sound like "realiz-ed" and "stop-ped". However, if I transcribed phonetically, it might appear as if I were attempting low-brow satire, and believe me, I would never do that to anyone that I hold in such high regard as Badi Assad. Not only is Badi Assad a wonderful and charismatic performer, but she is also a charming and bright person with a delightfully mischievous sense of humor. TONY MORRIS: Thanks for doing another interview, and let me ask you again, I know I asked you last time, but tell everybody the correct way to pronounce your name. AM: I know I've heard quite a few different pronunciations, "Body Acid", and all sorts of things. AM: Well, since you just recorded your 3rd CD for Chesky Records, tell us a little about that one. BADI: My brother and I, my brother Sergio, we had (an) idea of (a) record (that was) different of the other two records with Chesky. I would like to play more guitar on this (one). So, to make (an) interesting project, we began to think, and Sergio had (an) idea to make like an anthology of the Brazilian guitar. So, we chose 14 guitar composers and players from the beginning of the century up to now. And Sergio made new arrangements for each one of those piece(s). So, like anthology, I play music from each one, from the beginning of the century up to now. It's a beautiful project, I'm so happy. AM: So when will that one be released? BADI: I just left New York, and they are doing the editing. If we have the things going well, it will be released in January (97). AM: One of the things that you're known for is your amazing ability to combine the virtuoso guitar playing with your singing and the humming, the mouth percussion, all the hand percussion instruments� How did you decide to go in this direction and combine all these things? BADI: I never thought to make this! (laughs) In the beginning, I was just a classical guitar player. I began to play the guitar when (I was) 14 years old, with my father, he plays bandolim. At that time I was playing chorinhos, or Brazilian musics. I went to (the) University, Conservatory to study. When I was 20 I began to work in a musical in Sao Paulo, and in that musical I was singing. I was�How to say this? There were 200 women for 2 roles. I would like to be playing guitar in this musical, but they didn't need a guitar player. (laughs) So, to not lose my (audition) time, I said, "I can sing", to make audition. And I got it, and began to work during one year like a singer, (for) the first time in my life. After this musical, well, I almost stopped to play (the) guitar during one year. So I felt, (to) myself, "I am not a guitar player, I am not a singer.. So, I began to try to connect those things". AM: I just want to remind our listeners that your recordings contain no overdubs and now that I�ve seen you twice, I can personally verify that you can do all these things live, like�for example..
Well, tell us about 2 of these pieces where you combine all these things like "Tamoimoe"..
BADI: That's how I began. Because if you have a melody, and a percussion..you can use this.. How do you say this in English? Boca Chiussa? AM: Yes, "closed mouth", humming. BADI: Yes, so you have the mouth free to do any sounds that you want. So in that piece I have the melody like [hums softly] and I can click the tongue like this ["click", "clock", "sst"] and I can combine [she does] and I play the guitar with this. BADI: But in the beginning I was.. I got the scores, and put in over the notes, where I was making the.. How do you say, with the tongue? BADI: The click with the tongue. I was writing everything so I would be able to connect it. AM: So it looks like an orchestral score? BADI: Yes, like this, but nowadays I can separate this in my mind, and make different things. AM: And the other piece that is amazing is, "La Bela e Fera", tell us about that one. BADI: In that time, when I was trying to connect all my things, I began to have (a) class of percussion. Real percussion. Because, my brother Sergio told me, "You lost the punch, like a guitar player, you need to get this again. Why do you not try to have some percussion class? With percussion you need to have this punch; if not you don�t play! So I began to have class with a great teacher in Sao Paulo. Once, he was teaching me to play shakers. Each hand, when you are doing this, is doing a different kind of rhythm... "Polyrhythm?" BADI: Yeah, "polyhichimia!" (laughs) I was so good when (doing) that! (I said,) "Wait. Hold on. If I can do this, I can, instead of, to play with my left hand the shaker, I can try the guitar!" AM: Pretty amazing, still. Your brothers Sergio and Odair of course are the world-famous guitar duo. Just tell us a little bit about how they shaped your musical education. BADI: Up to now, they are so important for me. Every time I am with them, I have class, they are my masters (laughs). For sure, what I� of course they teach me fingers and technique; always; because they are so great! But what is most important for me is the way they play the guitar. They play with the heart. The technique is first, the technique you need to have this, because if you have (it), you have the freedom to forget about this when you are on the stage. And they are like that. When they are on the stage, the heart is playing, the soul is playing. This is most important for me, because I feel the same thing when I am playing. AM: Will you be recording or performing with Sergio and Odair any time in the future? Any possibility of that? I know a lot of people would like to hear that and see that! BADI: (grinning from "ear-to-ear") Yes. Nowadays they live in Brussells, Belgium, Europe, and I live in Brazil. So we are not able to perform, to have this possibility to play together. But we have in our minds, some day, of course, they play guitar and I play guitar. But we are happy that we didn�t make, up to now, this trio.. How (do)I say this?.. Because nowadays, I can bring for them, new things, so we are able, one day, to make a different guitar trio. AM: Let's see.. Actually I think I've covered about everything I wanted to mention. Is there anything you'd like to say? AM: I always ask people if..
AM: "Come see my show, buy my CD. Buy many copies of my CD!" Okay. Well I guess that's it then, that's plenty. Oh, can I get you to read that (promo statement), so I can use it on the show? BADI: Okay. Let me read it first! AM: My handwriting is pretty bad. BADI: I realize when I say "a-SADJI", nobody understands! When I say "a- SAD".. (It) makes a lot of difference to you? AM: Because we think it's a "j"..
BADI: But because this is not only (Brazilian Portuguese), it's from Rio, my accent. My accent is from Rio. And there, (everything) is so "ch", "ch", "ch", all the time. "Baji Assaj". But in Sao Paulo, we say "Baji Assad"
AM: Well, here we say "Body Acid"
AM: That's the accent here, in the US. BADI: (to the engineer, Scott) When you want? "Classical Guitar Alive", asi? Is this? AM: Yes, like "Viva la Guitarra", only in Ingles. BADI: Hello, this is Badi Assad, and you are listening to Classical Guitar Alive!